I say "I love [insert noun here]" a lot but rarely do I say it and mean it the way that I do for my Stateside home, Los Angeles. 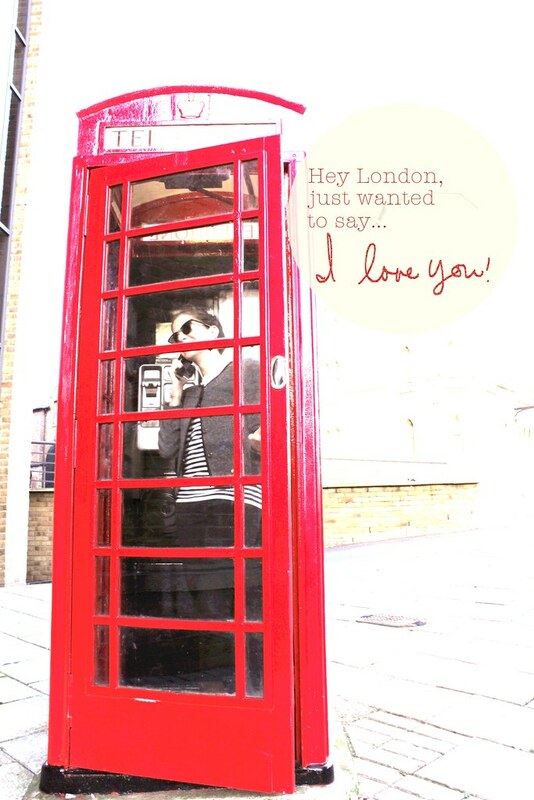 I Looooovveeeeee LA so you can imagine that saying a heartfelt "I love you" to our new home, London, didn't come easily. I liked London from the get-go, I recognized the awesomeness of the city and was excited to get to know it. But love it? Not so much. I was too busy getting used to cultural differences while growing increasingly frustrated with first-world problems that shouldn't exist in such a major capitol of the world (I know, it's petty , but wouldn't you expect good bank service here? The world banks here!). I had to experience more and do/see the subtle things that makes a place home for me. Visiting and living somewhere are totally different things and I'm sure that most of you will agree with me on that. We're not here on a whirlwind site seeing tour, it's not a pit-stop en route to a European holiday. This is our home at the moment and has been for the past eight months. I've gone from thinking that pubs are a place for daytime drunks to realizing that they're incredibly cozy homes away from home where entire families can enjoy great food and drink. I've seen simple acts of kindness on the tube between strangers and have helped countless moms get their pram (stroller) up and down station stairs. I now say things like "pram" (baby stroller) "toilet" (bathroom) "lift" (elevator) and "hire" (to rent) by default. We have our favorite local spots for Thai food, Italian, Persian, Mediterranean, and Sushi. Our baklava guy expects a visit from us at least once a week. I've found a hairdresser with the magic touch and independent shop keepers who carry the torch for customer service. I've indulged in the "making" and craft culture where every weekend there's a handful of craft markets or creative workshops to choose from. We've worshiped every ray of sunshine on those rare warm days when the entire city takes to the parks to lounge and picnic. I love that the leaves in our neighborhood are hand raked or swept rather than collected by noisy and dusty leaf-blowers. I've learned to recognize more international languages than I ever imagined. I've learned the best apps for getting around the transport system and feel totally natural hailing a beautiful classic black cab. I've learned to distinguish between (and better understand) different British accents. We get excited to see a new wine shop opening around the corner from our flat. I understand why small and independent high streets are so treasured. And most surprisingly, I've become defensive of the deeply significant phrase "Keep Calm and Carry On" - please stop bastardizing this, people! I literally cringe every time I see a new silly variation of the saying come up on Pinterest. So yes...given my running list of the things that I've come to learn and understand, I can finally (and genuinely) say those three magical little words to London. London - I've seen and experienced the real you and I love you. I really really love you.